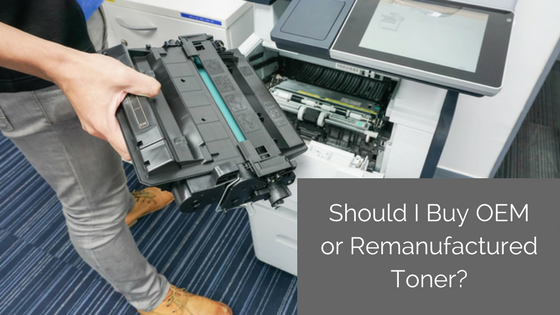 Should I Buy OEM or Remanufactured Toner? Every printer user has to decide if they want to use the original manufacturers toner (“OEM”) or after market re-manufactured toner in their machines. Because most people you talk to about this have a vested interest in your decision, it is hard to know what to believe. I am going to give you an objective overview, based on 25 years of experience in the printer industry, which I hope will help you make an informed decision. First I would like to discuss the OEM product. There is not much to say here because, if you use OEM toners you will get a consistent high quality product. This is not to say you won’t have an occasional issue but they will be few and far between. The only down side to the OEM is the cost. OEM toner will cost you 30% to 50% more than a re-manufactured alternative. This is not a small number especially if your office does a lot of printing. Because of this variance in price it is definitely worth considering an alternative to the OEM. In my experience, almost without exception, when I find an office which is using OEM toner it is because they have had a bad experience with re-manufactured toners in the past. Here are a few things, which I call false claims, to look out for, which may result in your expectations not being met. Our toners meet or exceed OEM standards. This is simply not true. It only makes sense that the original new toner from the manufacturer would be of the highest quality. However, this does not mean that a re-manufacturer cannot build a quality product at a much lower price point. Our toners last longer because we add more toner. It is possible for a manufacturer to add more toner to a cartridge than it was designed to hold. However, consider that the original manufacturer designed the internal components of the cartridge to last a specific amount of time and based the toner volume on those specifications. In my experience increasing the amount of toner while everything else stays the same will result in leaking and premature failure of the product. This results in a higher failure rate and the perception that the re-manufactured product is substandard. Claims of independent testing and certification. In my opinion these claims, which are attached to almost all re-manufactured toners, mean nothing. I have found that companies making the same independent testing claims vary in quality from excellent to horrible. Many companies attach a warranty to their toner that sounds too good to be true. Most of the time the process to make a warranty claim and get a refund is so cumbersome it is not worth the hassle. Furthermore, if you are continually having to make warranty claims, this will soon become cumbersome causing you to return to the OEM product. Now that you have some knowledge, and understand some of the pitfalls of this decision, let’s ask the million dollar question. Can I use re-manufactured toners, experience the cost savings and keep the quality at a level that will work for my office environment? My answer to this is a resounding yes! If you follow a few simple guidelines, which I have listed below, I assure your experience with re-manufactured toners will be a good one. We at Laser Age are committed to helping companies make the transition from OEM to Re-manufactured without experiencing any of the pitfalls I have discussed. It is extremely important that the company you purchase toner from is the same company which provides service on your machines. Toners are an integral working part of your printer and any quality issues you experience should be addressed by a reputable service company. Furthermore, a service company is not going to jeopardize their relationship with you by providing you with a substandard product. Your toner supplier should be able to provide an on-site response to any issue you have within a four hour window. This is another guarantee of quality, as they would not be able to afford to send a tech out every time you had a bad toner if they gave you a substandard product with a high failure rate. Do not go with the lowest bidder. Trust me on this one. Not all re-manufactured toners are created equal and it is important that you get a high quality product or you will introduce a nightmare scenario into you office. While you can save 30% and get a quality product, a 50% savings is not realistic and I can assure you will have problems if you go cheap. In conclusion, I would like to say, if you are not using a re-manufactured product which is backed by a reputable service company, you are throwing money out the window. Laser Age has converted many high profile customers to re-manufactured toner without issue. Many of these companies have been customers for over 20 years. We are confident that if we introduce a quality product backed with excellent service, the customer will experience a significant reduction in cost without sacrificing quality and reliability.